Mafia Billiard Tricks is a billiard arcade game in which you can play the challenging game of billiards. You are not only playing for fun though however, you and your opponents are part of the infamous mafia. You must earn their respect by beating each crew member at the game of billiards. There are 8 crew members that you must beat, each member will get progressively harder and higher in the mob hierarchy. Beat them all to eventually play the mob leader then beat him to become the new billiard king. So are you good enough to be the next champion? 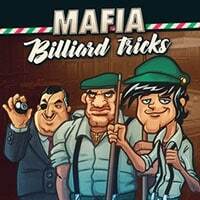 Enjoy and have fun in playing Mafia Billiard Tricks Game. Good luck.